The Pieta takes place just after Jesus is cut down from the cross. 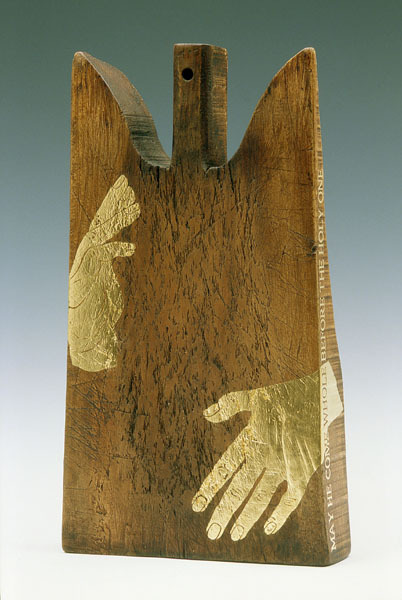 These hands placed on a cutting board convey Mary’s grief, loss and love as she cradles her son’s head and chest. This traditional style cutting board from Italy’s Piedmont region, remind me of doves flying to the heavens. The winged shape also echoes one of the devotees hands in the painting. An image of Jesus’ face and beard is seemingly apparent in the cutting marks of use and reminds me of the Shroud of Turin. The prayer “May he come whole before the holy one,” refers to the Jewish death ritual.